and shout praises unto the Holy One of Israel." Today is the first full day of Spring. And it snowed. Yet the sun was simultaneously shining, creating a heavenly and beautiful combination of white flakes drifting through golden sunlight. Yesterday was the Spring Equinox in the Northern Hemisphere. Equi, meaning equal, and nox, meaning night, indicates that (in some places on Earth), the scales of light and dark were in balance. After which, the tide will turn and increasing amounts of light will fill our days. The Spring Equinox represents new life and rebirth. In Christianity, the resurrection of Christ is celebrated on the first Sunday after the first full moon after the Spring Equinox. It is time for transformation and renewal, and gardening again. 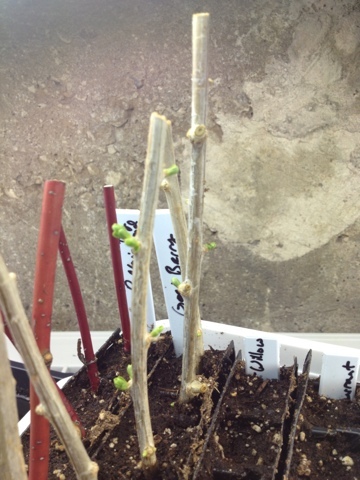 New life from Gogi Berry cuttings after one week of light and water. I've never really had the urge to publish a blog. I have little time to devote to such endeavors and I don't feel peace in much of what I see online. Although there is much good here, there is also much darkness. There are places to hide, places to be someone you're not, places to be tempted or distracted or deceived, and there are places to seek out things that are not of God or of any lasting value. This week, however, a theme came to mind that I feel impressed to write something about. The timing also seems right...with Spring here now and the opportunity for newness. The intent of this blog is to help spread the light and truth of the gospel of Jesus Christ and to encourage others to follow Him. In order to do so, we must often go forth among the wolves and the dark places of this world. I don't know if this blog will help turn the tide from darkness to light, but maybe in some small way it will help, even if it's just for my own posterity's benefit. However, the Lord also charges us to be wise as serpents and harmless as doves. In our day, these are critical characteristics to seek for and possess. I will talk in more depth about them in the future. By way of introduction, I am an active member of the Church of Jesus Christ of Latter-Day Saints who loves the gospel of Jesus Christ with all my heart. I take the gospel of Jesus Christ seriously and sincerely believe in, and try to live as best I can, the restored doctrines of Christ as revealed through the Holy Scriptures and His latter-day prophet, Joseph Smith Jr. We are truly living in the latter days of this world's existence. Christ's 2nd coming is near. The signs are all about us to so testify. Our common enemy, satan, is increasing in his powers of darkness and ability to lead people away from God. His capacity to deceive and blind the children of God is real and dangerous. However, this is also a wonderful and exciting time to be alive. There is no greater work than to assist in bringing others to Christ. There is a greater degree of truth and light available to us because of the truthfulness of the gospel and the power of our Savior. I will strive to follow the guidance of the Holy Spirit as I write. I wish to remain anonymous and give all the glory to God. I will approve most comments, as long as they are not blasphemous or derogatory. Comments are welcome, but please refrain from derogatory or blasphemous remarks. I moderate all comments so yours may not post immediately.